I walked into the new Arlon Rosenoff Gallery in Langley on a recent Sunday afternoon and the painter was busy. One painting was drying in the corner, while another was halfway finished on the easel. Meanwhile, a painting had been sold that afternoon and a couple was pondering the purchase of three more. 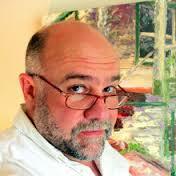 Rosenoff is a Boeing employee who paints about 100 paintings per year with a palette knife and oils. He’s been featured several times in American Art Collector Magazine and the new gallery has made the June issue of Southwest Art Magazine. Rosenoff and his wife Debbie moved to the island in March and brought the gallery along with them from its former location in Kirkland. He’s been painting seriously for five years and since 2009, Rosenoff has been featured in exhibitions both locally and elsewhere in the United States. But he said he can’t quit his day job at Boeing just yet. I must admit, it was nice to see an artist doing a swifter trade to the public than what was happening only a few years ago. It was great to be in Langley one sunny Sunday afternoon see folks buying art! Rosenoff took the leap when the opportunity to paint for real came to him. “I’ve been dabbling with art since I was a kid but never found anything that I liked,” Rosenoff said. Rosenoff owns no brushes and he likes it that way. “I don’t’ have to clean them. I don’t use any solvents,” he said. He does, however, own a gallery on First Street (where Eddy’s used to be) and you can see him painting there on Sunday afternoons. 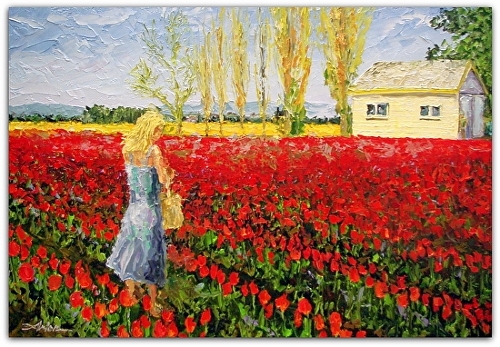 “Tulip Fields” by Arlon Rosenoff shows his signature style and theme. “I do every painting in one sitting,” he said. It seems the quick production of the work was necessary. Within the hour, Rosenoff sold at least three paintings. “I started this one at 12:30 and will finish it today. I’m working full time; I need that type of technique to do 100 paintings a year. I have friends who spend months on one painting,” he said. He said he loves the impulsiveness of the fast technique and the loose impressionistic style suits him. 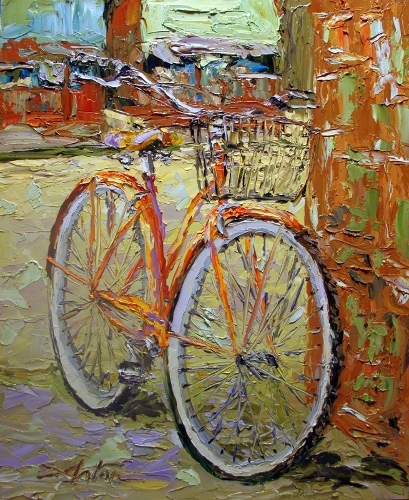 “Quick Stop” is another palette knife painting by Rosenoff. His paintings are vibrant, full of color and highly textured. They reflect an eye in love with such things as bicycles, scooters, streetscapes, fields of flowers, children by the beach, trolley cars, city-life and on-the-water-life; in other words, the scenes of a happy and colorful life. In short, the man paints because he loves to paint and that comes through in the work. The Arlon Rosenoff Gallery is at 306 Frist Street in Langley. 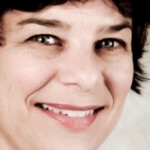 Rosenoff is in the WLM directory. Find out more about his work and gallery here. Find out more about the visual artists of Whidbey Island in the WLM directory here.